Thank you to Lorraine Bruce for posting a message in the EdinPhoto guest book. "I'm desperate to find any old memories or photos of three shops that my dad, William (Billy) Dutton managed in the early-1960s. He will soon be 80. His shops where the first ever roast chicken shops in Edinburgh. This was before the time when chicken were to be seen on spits in the window. "My father was born at Caroline Park. He was a charming and popular grocer, first working in Low's in Nicolson street and at Ratho Station. He then took over managing a string of Hillwood Produce shops. These were very new to Edinburgh at the time, long before Edinburgh had fast foods chains, and when chicken was hitherto a luxury roast for special occasions. 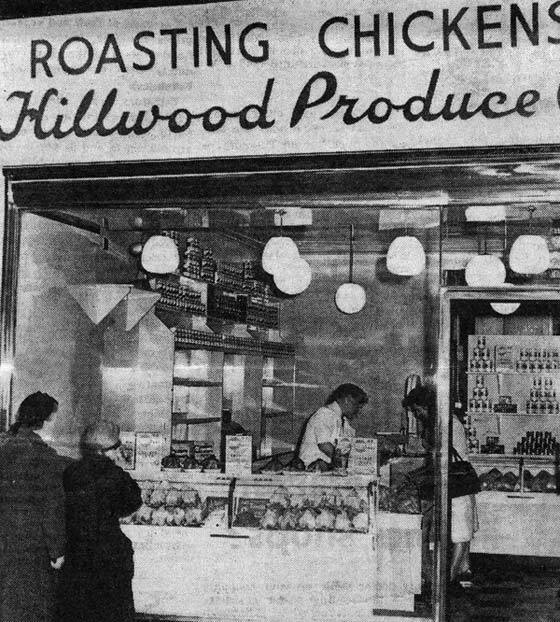 Hillwood Produce company roasted chickens. The chickens were not roasted on spits in the windows as they were by another business some years later, but roasted in ovens by Mrs Grinton who also made the best homemade sausage rolls ever. My father had a strong work ethic. I can recall going in to his shop during the week preceding Christmas and seeing floor-to-ceiling pallets of chickens waiting to be roasted. My father ran his shops in a very professional way. He was interviewed for radio programme, 'Farm Forum'. He was always charming and his customers loved him. He would hand out his recipes for cuts to anyone who asked. He believed that if one had to have canned goods in the shop, they had to be Baxters as he considered them the best at the time. His shop in South Clerk Street must have been pretty close to The Odeon. I can recall being sent off to the Odeon if the shop was busy." "I worked for the Hillwood chicken shop in Corstorphine. I delivered orders on a bike after school when I lived in Clermiston. I think it was about 1963-64." "I'm trying to get more information about my dad, Peter Nimmo, who along with his brother Alastair owned the chicken company, Hillwood Produce, that Loraine mentions above. My father died in 1973 and his brother died in 1972. I have old newspaper cuttings in scrap books that my mother kept showing photos taken inside the shops and the opening of the Clerk Street shop. My mother is now aged 97." *** I've checked in a couple of Post Office Directories (1961-2 and 1970-1) but not found this company listed. Thank you to Lorraine Bruce, née Dutton, who wrote again after reading 'Recollections 3' above. Sadly, Lorraine tells me that her father (mentioned in 'Recollections 1' above) has now died. "I've been missing my father a lot recently. I was amazed to read the comments from Anne Moir, daughter of the man who owned the shops where my father worked. What a surprise to hear that she has photos of the inside of he shops and of the opening of the Clerk Street store. I have no information for Anne other that that my father spoke highly of her father, and that I remember being taken to see thousands of hatchling chickens in huge round heated pens. Is there any way that I can contact Anne? I passed on the latest email address that I have for Anne Moir to Lorraine, but unfortunately Lorraine has not been able to get in touch with Anne. So if you read this, Anne, can you please email me and let me know how Anne can contact you? Thank you to Anne Moir for sending copies of the photographs and newspaper cuttings mentioned in 'Recollections 3' above, together with some comments about her father's businesses. with acknowledgement to Anne Moir for providing a copy of this photo. 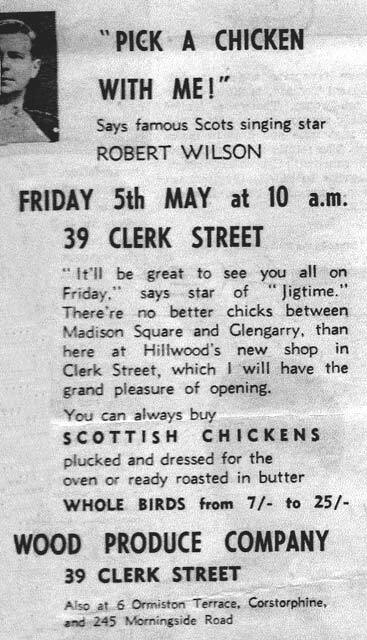 The article accompanying this photo mentioned that Hillwood Produce Co already had shops at Morningside and Corstorphine when the Clerk Street shop opened, and that the company's farm at Newbridge housed 42,000 chickens. - 'Easibuild', joinery contractors selling wooden sheds, coal frames and greenhouses." "All these businesses were situated on the same site at Ratho. My father bought a pig farm and kept the farm-house as his main office. Several ex-farmhands continued to live in the cottage on the land as tenants. He built the factory, timber- yard and chicken houses on the land." "The ill health of both my uncle Alastair Nimmo and my father Peter resulted in the joinery business being sold to 'James Whyte & Co', civil engineers, in the late-1960s. The business went bankrupt a few years later. The chicken business, including the four shops, was sold to Mr T Montgomery, the firm's Secretary. Unfortunately, the shops closed a few years later: I have no idea what happened. I'd love to discover more about what happened to the businesses. Sadly, my father died in 1973, a year after my uncle Alastair died, leaving us as a family with many unanswered questions as to why all the businesses were sold and lasted such a short time afterwards. "What a lovely surprise to read 'Recollections 5' above. I have no photographs of myself as a child but I do recall, very clearly, that there was a photograph of me with my father sitting outside the huge sheds that the 92.000 chickens were kept in. I recall also being taken to see the little yellow chicks in their heated pens. These all must have be part of Anne's father's business. We stayed in a farm cottage in Ratho. The farm was owned by the Baird Family who are based still, at Halyards farm Kirkliston. I have a feeling they would have know Anne's father as they bred chicken too - just a thought. I recall often going to see my father in the Clerk Street shop. He was proud of the shops. The same cook went with him. There were two huge ovens in the back of the shops. I wish I could recall more. I had long believed that there must be cuttings somewhere as dad was saying each time a shop opened the press were there and he was interviewed for Farm Forum. etc. I sent the message and newspaper clippings that I received from Ann Moir (Recollections 5, above) to Lorraine Bruce. Lorraine told me that one of the photos included her father, working in the Hillwood Produce shop at Morningside. Lorraine sent the photograph of the Hillwood Produce shop at Clerk Street to her uncle, Stan Forbes, who was born at Boswall Place and now lives in Australia. "I served an apprenticeship in the Leith shipyards as a shipwright and later went to sea as a ships carpenter." "During one of the quieter spells in the shipyards, I was employed by Peter Nimmo of Hillwood Produce, Ratho Station Road, making garden sheds. It was the last opening on the right (with Corstorphine behind you) just before the big roundabout at the start of the Glasgow/Livingston motorway." "The farm at Newbridge that I lived on as a toddler is still there, but the fields are gone.